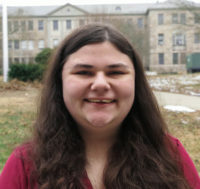 Laura Weick | URI can now enjoy cookies until 3 a.m.
Insomnia Cookies is the only nationwide food chain I can think of that specifically targets college students. The bakery’s gimmick is that they make their cookies in store and deliver them to students’ dorms as late as 3 a.m. There are already over 100 Insomnia Cookies locations across the country, and all of them are located near at least one college. Students at other New England colleges such as The University of Connecticut and Brown University have already gotten a taste of the treats, as well as students in other parts of the country ranging from Texas to California. Insomnia Cookies opened a new location in the Kingston Emporium this fall. The convenience of the new bakery certainly sounds appealing, but in my opinion, this means nothing if the quality of the food is disappointing. As I live off campus and outside of the bakery’s delivery zone, I ordered and ate my snack in the store itself. The store was small, with a modest bar-style table with a few stools. However, the seating was comfortable, the dining room was clean and the staff was friendly, so this is not much of a problem unless you are visiting with a large group of people. After all, the main focus of this bakery is delivery, so large seating areas will most likely not be prioritized. The menu includes several varieties of cookies, from classics such as chocolate chip and sugar cookies, to more unique offerings like double chocolate mint and white chocolate macadamia. Insomnia Cookies also sells three varieties of deluxe cookies: chocolate peanut butter cup, s’mores and triple chocolate. These cookies are larger and more complex than standard cookies, but also pricier. Other options include brownies, ice cream and cookie cakes that can be made as large as 10 inches in diameter. Insomnia Cookies also offers catering packages that include multiple cookies and brownies, designed for larger gatherings. I ordered a “Cookiewich,” which is an ice cream sandwich made with the cookies Insomnia Cookies prides itself on making in-store. You can choose any combination of cookies and ice cream that you’d like for your creation, so I opted to order a Cookiewich with a double chocolate cookie on top, a regular chocolate chip cookie on the bottom and cookies & cream ice cream filling. The cookies were warm and gooey. I loved how soft and fresh they tasted. The double chocolate cookie tasted particularly rich and dark. The chips in the cookies were decently sized chunks and complemented the batter quite well. The ice cream was creamy and sweet, with small Oreo chunks peppered in vanilla ice cream. I do wish the Cookiewich had a bit more ice cream inside. The scoop was pretty small, and when sandwiched between two warm cookies, the ice cream became pretty thin. However, the bakery probably uses less ice cream to prevent the sandwich from becoming too messy. The sandwich is already messy enough that you can’t pick it up with your hands without getting drenched in chocolate and ice cream, so the store provides a paper plate and napkins with your treat. The Cookiewich itself was gigantic. I ordered the smallest cookie sandwich possible and I was still close to full by the time I was only halfway done with the dessert. 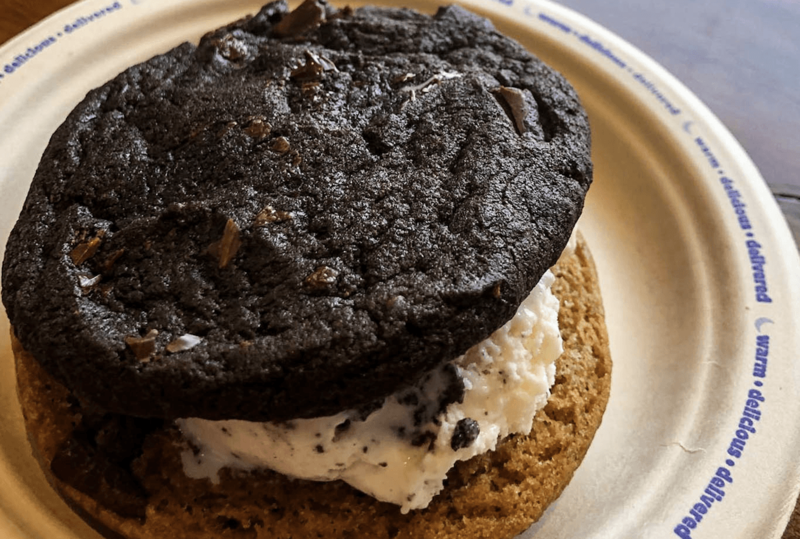 Yet Insomnia Cookies offers even larger portions in the form of the Deluxe Cookiewich, and the Bigwich and Deluxe Bigwich, which are filled with icing instead of ice cream. I will admit the desserts are a bit pricey for a broke college student like me. The ice cream sandwich cost $5.90, although it was large in size, I feel that I could have gotten a dessert for the same size for half the price. However, one cookie is only $1.60 which is similar in price to a candy bar, so perhaps it is the more complex treats that are a little pricey. If you’re on a tight budget, you may want to limit how often you order delivery or visit the shop. But overall, I would recommend trying Insomnia Cookies at least once. The cookies are high quality and a perfect way to satisfy your sweet tooth.